Lemon soda and the life around it. 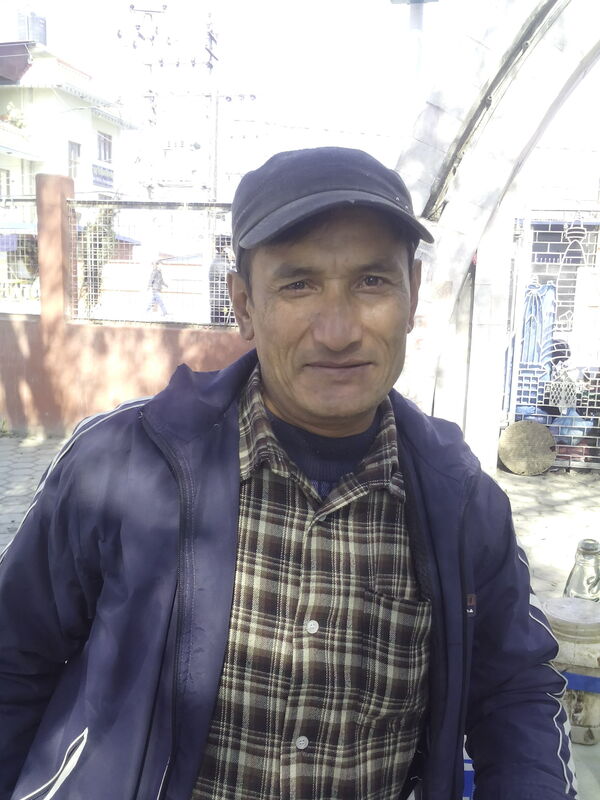 Mr. Ganesh Das Maharjan, a street vender selling Lemon Soda drinks for more than 25 years, who now locate himself at the corner of Bhikuti Mandav, Kathmandu. He comes there as early as 9 am until 4 pm in the evening during winter season where he waits for the customers come by for drinking lemon soda and others like cola, pineapple, orange flavor drinks in his mobile shop. Waiting for the customer to be arrived.. 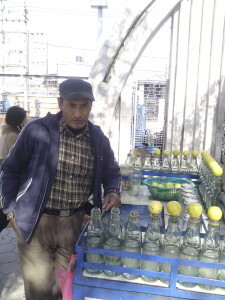 He explained, ” Now is the low season for his small business.” He even claimed to sell 300 bottles per day during peak season and he is eagerly waiting to arrive saying,” now just 2 months left for the arrival of the season.” These days, the number of lemon soda drinkers in his shop has been increasing in comparison to previous days of his life. He said he has a small plant for making soda in which he fuses oxygen and carbon with raw materials required to make soda drinks as well as other flavor’s drinks. 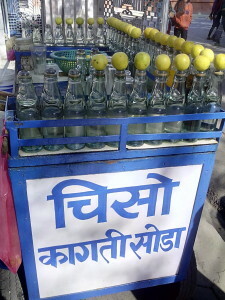 Once they have pressurized into bottles, they are to be sold in Rs 40 per bottle. He managed to bring Lemon at Rs 100 per kg from near other shop. He remembered he used to sell lemon soda drinks in just at 50 paisas. His business of this lemon soda drinks making and selling was being run by his father and forefathers, and sisters. He claimed to be the best to drink lemon soda as he explained it removes the hang over of head from drinking hard drinks and it is also good for digestion after having heavy meal at the party. He doesn’t have a brand yet, but he feels Lemon soda may even replace the Coca cola, Fanta, and the other brands from having benefits more than those unhealthy drinks. He also told to be cautious about the drinks made in other mobile shop who use dirty waters to make them. He assured his Lemon soda is healthy, and he don’t use dirty waters to make it. Many people come by in a bike or those passerby who just visit the functions in the Bhikuti Mandav stay there aside of his mobile shop and drinks Lemon Soda. He has been quenching thirst of many many thirsty customers so far, and he is still around the same place now – selling COLD LEMON SODA. Ganesh Das Maharjan – LEMON SODA SELLER. Great awesome things here. I¡¦m very glad to peer your post. Thanks so much and i am having a look forward to touch you. Will you please drop me a e-mail? I would like to convey my affection for your kindness giving support to men and women who actually need help with this question. Your real commitment to getting the message up and down has been exceptionally practical and have really allowed guys much like me to arrive at their desired goals. This interesting help and advice signifies a whole lot to me and substantially more to my office workers. Thanks a ton; from all of us. Good post. I learn something totally new and challenging on websites I stumbleupon everyday. It’s always useful to read articles from other writers and use a little something from other sites. wonderful post, very informative. I’m wondering why the opposite specialists of this sector do not understand this. You should continue your writing. I’m sure, you’ve a huge readers’ base already! Usually I do not read post on blogs, however I would like to say that this write-up very forced me to try and do so! Your writing taste has been surprised me. Thank you, very nice post.